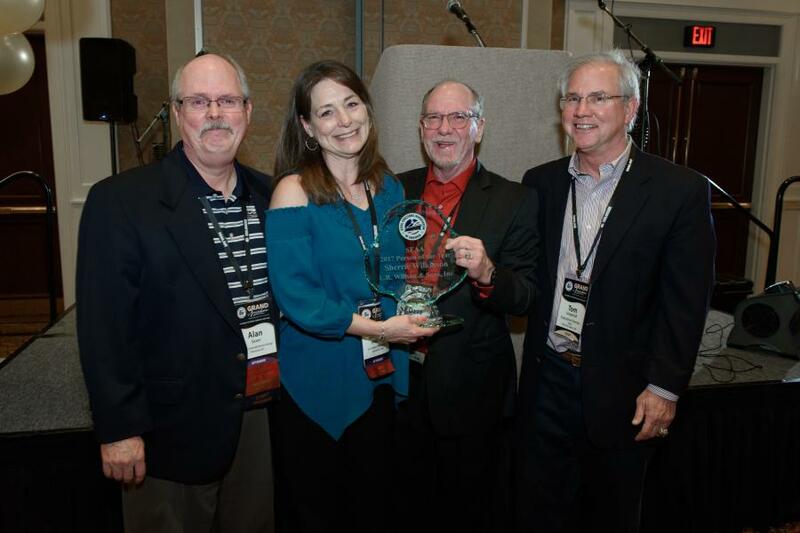 (L-R) are Alan Sears, master of ceremonies; Sherrie Wilkinson, SEAA’s Person of the Year; Dave Schulz, SEAA president; and Tom Underhill, SEAA executive director. Sherrie Wilkinson of L.R. Willson & Sons Inc., Gambrills, Md., was named the 2017 Person of the Year by the Steel Erectors Association of America. She came to her family's business more than 20 years ago, and currently serves as director of human resources. Wilkinson has served on the SEAA board of directors for four terms. L.R. Willson & Sons Inc. got its start more than 45 years ago, initially as a welding shop founded by Wilkinson's grandfather. “The company started erecting bar joist and so built a crane to do the work. Like many companies, eventually the crane and erection jobs were generating more volume than the welding, and so my grandfather started a second business. The new company was owned and operated by my uncles and my mother,” said Wilkinson. Today it provides structural steel, precast and tilt-up panel erection as well as crane rental services. Wilkinson credits her mother, Mary Sharp, who recently passed away at the age of 76, with getting her into the family business and being her mentor. “She had a knack for matching people's abilities with the right job. She was right on with me as I've come to love what I do,” said Wilkinson. L.R. Willson was early supporter of the Steel Erectors Association of America. “If you want your industry to be better, for regulations to be favorable to your business, and for your business to thrive through constant innovation, then you have to get involved. I've enjoyed working with the other SEAA board members, who are open minded to change, creative in solving problems we all face, and truly care about improving the safety and productivity of the steel erection industry,” said Wilkinson. In addition to serving on the SEAA convention committee for many years, Wilkinson also was active in the now shuttered local Mid Atlantic chapter of SEAA.